1) Az. three barks or. 2) Gu. three covered cups ar. 3) or Ayre (Nottinghamshire). Gu. three doves close ar. beaked and membered or. 4) (Isle of Ely). Ar. on a chev. sa. three quatrefoils or. 5) (Nottinghamshire). Gu. three martlets ar. membered or. Crest—On a ducal coronet or, a wivern vert. 6) Ar. a bend az. betw. two mullets gu. 7) (Lincolnshire). Ar. on a chev. sa. three quatrefoils or. Crest—A leg erect in armour per pale ar. and sa. couped at the thigh gu. knee-cap and spur or. Motto—Laeto aere florent. Another Motto—Lighter than air. 8) Az. three barks or. 9) Gu. three covered cups ar. 10) or Ayre (Nottinghamshire). Gu. three doves close ar. beaked and membered or. 11) (Isle of Ely). Ar. on a chev. sa. three quatrefoils or. 12) (Nottinghamshire). Gu. three martlets ar. membered or. Crest—On a ducal coronet or, a wivern vert. 13) Ar. a bend az. betw. two mullets gu. 14) (Lincolnshire). Ar. on a chev. sa. three quatrefoils or. Crest—A leg erect in armour per pale ar. and sa. couped at the thigh gu. knee-cap and spur or. Motto—Laeto aere florent. Another Motto—Lighter than air. The last Ayers is derivative, or possible patronymic (descendant of) of the English surname Ayer or Ayre, a name which derives from the Middle English word eir or eyer, meaning “heir”, or the Old French eir or heir, ultimately from the Latin word heres. It is thought to have denoted a person who was known to be an heir to a large property or estate in the local area. A second possible origin theory is that this surname developed as a patronymic form on the personal (first) name Aier or Aer, derived from the Olde English name Ealhhere, consisting of the elements ealh, meaning “old”, and heri, meaning “army”. The family had a strong presented in Derbyshire, Wiltshire, and Shopshire. Evelyn Phillip Shirley states the following in her 1866 book titled The Noble and Gentle Men of England: “The Eyres appear as witnesses to charters in the Peak of Derbyshire in the remotest period to which private charters ascend. The first of the name known is William le Eyre, of Hope, in the reign of Henry III”. It is also believed they were established in Ayrshire in southwestern Scotland, which is another possible (third) origin theory of the family. William Arthur stated the following in regard to this line of thought: “It may come from Jar, west—the course in which the river runs; or Air, slaughter, the place of battle. The Celtic Aer, and the Welsh Awyr, signify, radically, to open, expand or flow clearly; to shoot or radiate”. 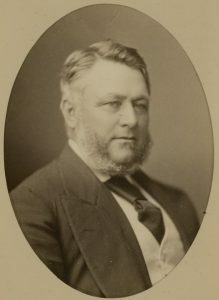 A fourth and final theory is offered by Henry Barber in his 1903 book titled British Family Names: “From the Flemish, Eyer, Eyers; a personal name”. In his 1857 book, An Etymological Dictionary of Family and Christian Names, William Arthur states offers the following legend: “The first of this family was named Truelove, one of the followers of William the Conqueror. At the battle of Hastings, Duke William was flung from his horse, and his helmet beaten into his face, which Truelove observing, pulled off, and horsed him again. The duke told him ‘Thou shalt hereafter from Truelove be called Eyre (or Air), because thou hast given me the air I breathe. ‘ After the battle, the Duke, on inquiry respecting him, found him severely wounded (his leg and thigh having been struck off); he ordered him the utmost care, and on his recovery, gave him lands in Derby, in reward for his services, and the leg and thigh in armor, cut off, for his crest; an honorary badge yet worn by all the Eyres in England”. I have identified two Ayers family mottos: 1) “Laeto aere florent” (They flourish in the glad air) and 2) “Lighter than air”. Spelling or names with similar etymologies include Ayer, Ayre, Ayres, Ayris, Ayar, Ayars, Eayrs, Eyre, Heyre, Eyers, Airres, Eyres, Eayers, Ayeres, and others. Robertus filius (son of) Aier was documented in the Red Book of the Exchequer in 1166 AD. Robert Aier was documented in the Pipe Rolls of Shropshire in 1201 AD. Ralph le Eir was documented in the Feet of Fines of Essex, England in 1208 AD. The Hundred Rolls of 1273 AD, a census of Wales and England, known in Latin as Rotuli Hundredorum lists three bearers of this surname: John filius Aer (Salop), Henry Ayer (Lincolnshire), and Richard le Heyre (Gloucestershire). Reginald Ayr was the Clerk of Ayr, Scotland in 1287 AD. Albinus Ayr received a charter of lands in Scotland from King Robert the Bruce in 1315 AD. Robert Airres was documented in Siministoun in 1692 AD. The last name Ayers ranks 812th in popularity in the United Status as of the 2000 Census. The name ranks particularly high in the following four states: Virginia (345th), West Virginia (387th), Tennessee (398th), and Georgia (441st). The surname Ayers frequency/commonness ranks as follows in the British Isles: England (3,243rd), Scotland (15,445th), Wales (2,515th), Ireland (9,929th) and Northern Ireland (15,263). 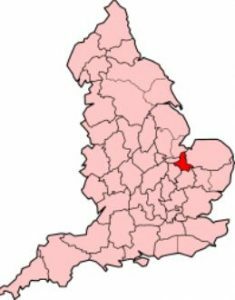 In England, it ranks highest in counties East Riding of Yorkshire and Lincolnshire. In Scotland, the surname ranks highest in South Ayrshire. In Ireland, it ranks highest in Munster. In Wales, it ranks highest in Carmarthenshire. The name is also present throughout the remainder English speaking world: Canada (4,017th), New Zealand (1,837th), Australia (3,742nd), and South Africa (25,048th). The first known ancestor or progenitor of this family is considered to be Humphredus Le Heyr, who was born in Wiltshire, England in 1108 AD. He married Galecia Foljambe and had a son with her named Truelove. Truelove Le Heyre or Le Heyr was born in Bromham, Wiltshire, England in 1135 AD. Legend has it that he was with William the Conqueror during his Norman Invasion of England, and when the King fell off of his horse and his armor was suffocating him, Truelove picked him up and saved him, where upon the king named him Ayers and gifted him land. Williams son, John Ayers or John Eyre, was born in Wedhampton, Urchfont, Wiltshire, England in 1500 AD. He married several times and had the following issue: Joanna, Ellin, Alice, Jane, Margaret, Anne, Editha, John, Robert, Christopher, William, John and Richard. His son, Robert Ayers or Robert Eyre Esq., was born in Wedhampton, England in 1519. He was a mayor and Member of Parliament. He had issue as follows: Thomas, John, Robert, and Melior. His son, Thomas Eyre, Ayers, or Ayer, was an Esquire and Member of Parliament born in Sailsbury, Wiltshire, England in 1549 AD. He had issue as follows: Robert, Melior, Lyonell, Catherine, Giles, John Sr., Rebecca, William, Jane, Elizabeth, Elynor, Anne, and Frances. 2) Robert Ayers was born in Ogbourne St. George, Wiltshire, England in 1625. He married Elizabeth, daughter of Henry Palmer and Elizabeth Parker, and had issue with her as follows: Robert, Elizabeth, Captain Samuel, Mehitable, Timothy, Hannah, Mary, James, and Elizabeth. 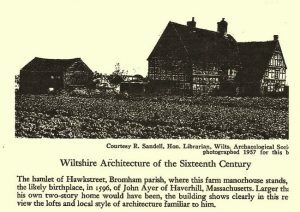 3) Thomas Ayers was born in Haverhill, Massachusetts c. 1626. He married Elizabeth, daughter of John Hutchins of Newbury and Haverhill, and had issue with her as follows: John, Elizabeth, Mary, Love, Thomas, Samuel, and others. 4) Peter Ayer was born in Haverhill, Massachusetts in 1633. He married Hannah, daughter of William Allen of Salisbury, and had issue with her as follows: Ruth, Hannah, Abigail, Mary, Martha, Lieutenant Samuel, William, Rachel, and Ebenezer. 5) Obadiah Ayres was born in Salisbury, Massachusetts in 1635. He married Hannah, daughter of Captain John Pyke, and had issue with her as follows: John, Thomas, Anson, Samuel, Obadiah Jr., Joseph, Mary, Sarah, Hannah, and Robert. 6) Nathaniel Ayer was born in Salisbury, Massachusetts in 1655. He married Tamesin, daughter of John Treloar, and had issue with her as follows: Elizabeth, Nathaniel, Obadiah, Ruth, Benjamin, Mary, Hannah, and others.